Paying less each month than they were in rent, and being able to put the money into the bricks and mortar of a quality four-bedroom family Bovis Home, made FirstBuy a double delight for Linzi and Richard Sewell. 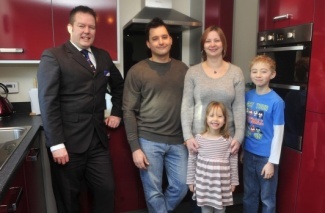 The Government-backed shared equity scheme has unlocked the homebuying dreams for the Sewells, who are now settling into life in their spacious new four-bedroom semi-detached home, with children George, 10 and four-year-old Chloe at Bovis Homes' exciting College Gate development to the west of Birmingham. Accounts Assistant Linzi, 29, said: "We first heard about FirstBuy on the news when it was launched and because it only needed a small deposit it sounded like the ideal way for us to get on the property ladder. "We had been looking for a property for a month or two before we had our first appointment with Bovis Homes at College Gate. The location at Oldbury was ideal and after we had visited the development we found we liked the house layout and the staff were extremely helpful. 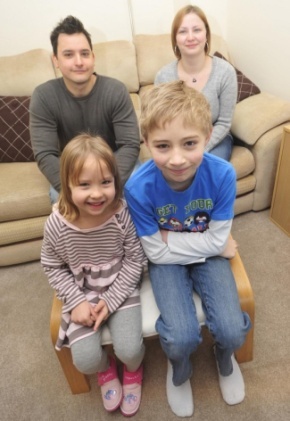 "We are now living in a four-bedroom Brandhall house and it is great to know that we finally have our own home at long last - and we are actually paying less now than we were in rent every month." FirstBuy is designed to get first-time buyers, or those re-entering the market, onto the property ladder. It works with a joint 20% loan from the Government and Bovis Homes, with the purchaser only needing a 5% deposit and a 75% loan-to-value (LTV) mortgage which will come at a much lower interest rate than higher percentage LTV mortgages in the market place. The buyer has 25 years to pay back the equity loan, of which the first five years are interest-free. Bovis Homes will steer the homebuyer through the process, offering them access to an independent mortgage broker and Local Homebuy Agent who will check eligibility and talk through all the figures. Bovis Homes Regional Sales Director Alison Tindle said: "FirstBuy is proving tremendously popular with Midlands first-time homebuyers and when you look at how the figures stack up, it's really not surprising. "While rents have gone up, interest rates have stayed at historically low levels and housebuilders, banks and the Government have worked hard to develop purchase assistance schemes like FirstBuy that have helped to unlock the market. We're delighted that it has helped Linzi and Richard realise their housebuying dreams and there are more and more people who are seeing the benefit of making their move now." At College Gate FirstBuy is available on two, three, four and five bedroom homes, with prices beginning at £132,995. At that price the buyer would need a deposit of just £6,650 and have an initial mortgage of £99,746.